Terry rates his latest minding job (a dog with a thirst for beer) as an all-time low. So when Arthur dangles what appears to be a cushy number – driving a chap called Mr Lily around for a few weeks – he’s interested, although he’s also waiting for the inevitable catch. When Mr Lily turns out to be Rose Mellors (Ann Lynn) certain alarm bells should have started to ring for him. But it’s only when Rose’s car is stolen from under Terry’s nose that things really start to go awry. Rose explains that she uses the car to courier stolen diamonds and that a consignment (worth £100,000) was in the car at the time. The owner of the diamonds, Mr Tajvir (Zia Mohyeddin), gives Arthur, Terry and Rose a choice – the diamonds returned or they can expect their health to start deteriorating very quickly …. Following her S1 appearance in Bury my Half At Waltham Green, Rose Mellors makes a welcome reappearance here. As previously seen, Rose is the wife of a major criminal (currently enjoying a long stretch inside) and has clearly picked up some tips from him over the years. For example, when Rose becomes the object of unwelcome attention from a hairy type at the local pool club, she’s quite prepared to give him a quick slap with his own cue to quieten him down. For once, both Arthur and Terry are innocents – neither were aware that “Mr Lily” was actually Rose. But given that their previous encounter with her was slightly bruising, it’s possibly not too surprising that she used an alias to begin with. Arthur remains in the dark a little longer than Terry, which allows Terry to wind him up (telling him that Mr Lily enjoys dressing up in women’s clothes and also likes to give him a peck on the cheek). The ever dependable John Ringham plays Harrison, an exasperated police officer who has to contend with Arthur (he’s come to the station to report Rose’s car as stolen and is insistent that the police do their duty). 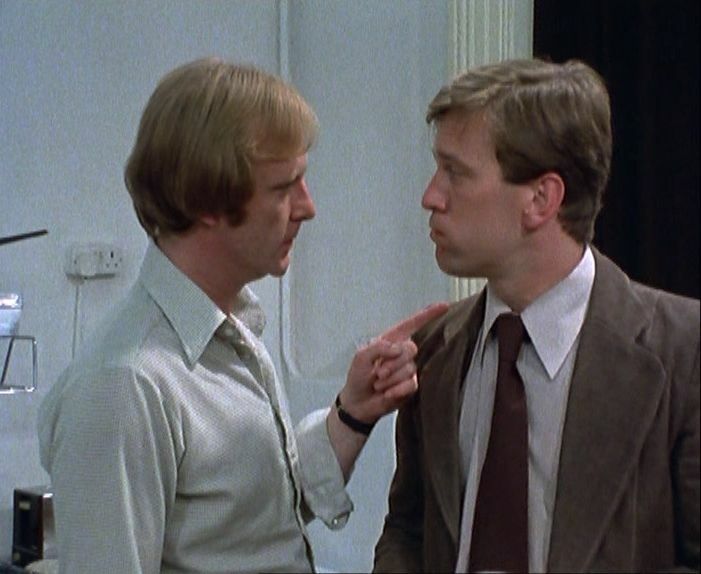 This was a point in the series where the comedy would have been ramped up a little had there been a regular police face for Arthur to interact with (Harrison never appears again). George Cole still entertains in these scenes though, as Arthur’s clearly not impressed with the efficiency of the modern police force. “You’re not like the way you’re shown on the telly, I’ll tell you that. There it’s one phone call after another, grab your hat and off. Diving in and out of cars, bells ringing in all directions. Book him Dano, Murder One. Here, it’s like rest time at the old folks home”. Ringham is equally as good. Harrison wonders why Arthur is so keen to assist Rose. “In all my years I’ve never known you so much as help an old lady across the street unless you were paid for it”. Lovely stuff, as is Arthur’s affronted reaction. And whilst Arthur’s at the police station, Terry’s in bed with Rose. He clearly believes in fiddling (as it were) whilst Rome burns …. Tony Selby, as Rose’s hapless gofer Jack, also reappears from Bury My Half At Waltham Green, and his presence helps to inform the audience that Rose knows much more about this business than she’s letting on. Not the most complex story that the series ever produced, but there’s plenty of entertaining dialogue along the way. Although not all of it is connected to the matter in hand – for example, the banter between Arthur and Dave at the start of the episode. Arthur is attempting to tell Dave a very funny story about a chimpanzee who goes into a pub, but finds his storytelling flow constantly interrupted by pointless questions from Dave (“was the chimp over eighteen?”). Arthur manfully presses on, but since Dave beats him to the punchline it was hardly worth the effort! Todd (Patrick Allen) and Casey (Patrick Bedford) have formed a profitable criminal partnership. The mysterious Todd is a well-connected man who always seems to know when wealthy marks will be away from home – but he needs the skills of Casey, a noted safebreaker. They’re very different characters though. On their latest job, Todd thinks nothing of clubbing down an au pair who unexpectedly returns to the flat they’re burgling (with an off-hand comment of “stupid cow”). This perturbs Casey, who hates violence and recoils at the sight of blood. Casey’s wife, Sandra (Jean Marsh), urges him to cut his ties with Todd, but as he’s earning good money he’s prepared to ignore his scruples. When the au pair dies and Casey is arrested on another job, things look bleak for him. But a wily lawyer sees a chance to blame Casey’s self-inflicted injury on police brutality – with Gideon in the frame ….. The incomparable Patrick Allen – possessor of the type of voice I could listen to all day – is in fine form as Todd. By night he’s a violent criminal, but by day Todd’s a respectable stockbroker, moving in the best of circles with his cultured and beautiful girlfriend, Anne Beaumont (Ann Lynn). Lynn’s one of those actresses who, if you love television of this era, you can’t help coming across. Sergeant Cork, Public Eye and Minder are just three series graced with her presence. Elsewhere, Jean Marsh is a vivid screen presence as Sandra. Following her husband’s arrest, Sandra attempts to extract the money he’s owed from Todd, with fatal results. The moment of Sandra’s murder is nicely done. As so often in GW, we don’t actually see the fatal blow struck (the camera is elsewhere at the time) but the quick cuts – and Todd’s expression afterwards – still make it a chilling moment. It’s jarring to see Gideon accused of hitting a suspect. Jack Regan maybe, but not the avuncular George Gideon. This feels like a theme drawn more from the books, which tended to paint Gideon’s world in shades of grey, as opposed to the resolutely black and white world of the television series. In Creasey’s novels, Gideon had to traverse a more morally corrupt landscape, where even his own colleagues couldn’t always be counted upon. But whilst the series caught the flavour of the books they also tended to rub off the sharp edges (although the ending of this episode is rather bleak). However I’m glad they never carried over the practice of having Gideon referred to by his colleagues as “Gee Gee”. It wouldn’t seem right to me for John Gregson to be referred to that way! There are some series which I’m glad to have, but don’t tend to get rewatched that often. Gideon’s Way isn’t one of them. Gregson and Davion form a solid partnership, the scripts are generally very strong, the guest casts can rarely be faulted and the extensive location filming in and around London is yet another reason why this is a programme to be cherished. Possibly because it didn’t fit the usual template for ITC filmed series, it’s never had the profile of the likes of The Saint, but Gideon’s Way is an endlessly entertaining series that I can come back to time and time again. The death of an ex-villain called Trumble provides Cork with a puzzling mystery to unravel. Trumble was well known to Cork and the news of his murder is greeted with sadness by the Sergeant. His attitude is in sharp contrast to Inspector Bird, who views Trumble’s modest house with distaste and asks Dr Stuart (Robert James) “what is a case like this to do with people like us?” Trumble’s death has caused unrest in the East End and the police are struggling to maintain order. This also irks Bird. The arrival of Cork changes things. Unlike Bird, he’s happy to talk to the unruly crowd and he tells them that Trumble was just as much his friend as he was theirs. His bluff way does the trick and the crowd disperse – although it’s noticeable that Bird doesn’t acknowledge this. Cork brings the police photographer Perryman (John Junkin) to the crime scene. This is something else that irritates Bird – why waste resources on such a squalid case? Cork reminds him that photography is now becoming standard (a sign that the police are slowly beginning to embrace modern technology). Fingerprints, one of Cork’s hobby-horses, are also mentioned, although Bob reminds him that they can’t be used in evidence. Rex Firkin spent most of his career working as either a producer (Emergency Ward 10, The Planemakers, The Power Game) or an executive producer (Budgie, Upstairs Downstairs) but he did direct from time to time. His sole Cork credit is unusual, as he didn’t have a production role on the series (unlike most of the other programmes he directed). Based on the evidence of this episode it’s a pity he didn’t direct more. The opening scene is especially interesting – the camera moves from the street (studio-bound, naturally) into Trumble’s house and then back out again. Following Trumble’s death the camera follows a young urchin (John Barnham) as he ducks out of sight (Firkin is able to make full use of Anthony Waller’s well designed street set). Sound effects (horses’ hooves, barrel organs) also help to create the illusion of a busy thoroughfare. The Case of the Slithy Tove has a very strong guest cast. Ann Lynn is vulnerable as Trumble’s daughter Nora and the always dependable Robert James has a decent role as Dr Stuart. It’s a pity that James never returned as the doctor as he would have been a good semi-regular, but James does have two further Cork credits (playing different characters). 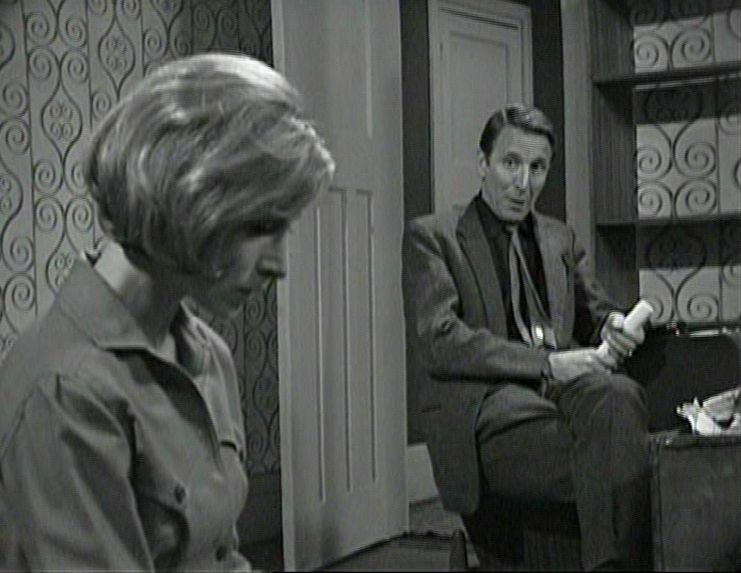 Peter Fraser (probably best known for playing David Campbell in the Doctor Who story The Dalek Invasion of Earth) is slightly wooden as Nora’s fiance, Sam Manners and whilst it’s always nice to see John Junkin, he has little to do as Perryman. Bruce Beeby, who amongst various roles played Mitch in the radio serial Journey into Space, is the enigmatic Lake. Cork does eventually run him to ground, but the story he has to tell is unexpected. This leaves something of an open ending – Bob asks Cork what he plans to tell Inspector Bird, but Cork doesn’t answer. It was common for Sherlock Holmes to decide at the end of a case that no further action would be taken, but he was a private individual and not bound by the law. Would Cork feel it was his duty to report everything he knew to Bird or would he decide that things were best left as they are? The first of eight Cork scripts by Bruce Stewart (who would later pen three of the four Timeslip serials) The Case of the Slithy Tove is another very enjoyable series one episode. After jumping ahead to sample from episodes from series seven, it’s back to series one and the second episode – Bury My Half at Waltham Green. Arthur convinces Terry that it’s the easiest money he’ll ever earn – all he has to do is mind Albert Stubbs (Nicky Henson) for a few days. Stubbs has just been released from prison and is keen to dig up a large stash of money stolen by him and his associates. Rose Mellors (Ann Lynn) is the formidable wife of one of Stubbs’ old colleagues and she, along with her gorilla of a minder Jack (Tony Selby), is hot on their trail. Terry’s got problems though – Stubbs is erratic and unpredictable and he quickly makes Terry’s life a misery. When Jack pays them a visit, he manages to extract him from Terry’s grasp and proudly takes him back to Rose. She’s far from impressed though – she doesn’t know who he is, but he’s certainly not Albert Stubbs ….. Bury My Half at Waltham Green is an excellent early example of Arthur’s highly devious nature. Knowing full well that Stubbs would be a hunted man from the moment he was released, he arranged for Terry to mind a decoy. The man that Terry thought was Stubbs is actually a character called George Wilson. It’s fair to say that Terry’s far from pleased at being manipulated in this way, but he’s going to have to get used to it as it’s going to happen on a regular basis from now on. Nicky Henson’s good value as the ebullient Stubbs Mk 1 whilst the ever-dependable Kenneth Cope is just as solid as the real, if rather less jovial, Stubbs. Ann Lynn is a memorable femme-fatale who’ll stop at nothing (including bedding Terry) to find out where Stubbs is. When Arthur learns that Terry’s slept with Rose, his expression is a joy to behold! Tony Selby rounds off the first-rate cast as the accident prone, but intimidating Jack. Both Lynn and Selby would return as Rose Mellors and Jack in the series two episode Diamonds are a Girl’s Worse Enemy. If you want to be picky, then it’s hard to believe the rather elaborate decoy scene which sees Arthur and Stubbs drive off in a car (watched by Rose, Terry and Jack). Rose and Jack follow them, but don’t realise they’re actually following an identical car, which contains Terry and George. This scheme seems to have been dreamt up by Terry within a very short space of time and it does beggar belief that he’d be able to rustle up two identical cars (plus a lorry to drive one of the cars into) so quickly . After various adventures, Albert digs up the money, although his joy is short lived as Rose steps in to relieve him of it. Arthur also manages to get a small share, but the sting in the tail is left until the end – as it’s revealed that the money (comprised of one pound notes) is no longer legal tender, because those type of notes were phased out the year before. It’s maybe a coincidence that the very next episode also revolves around a large sum of money which turns out to be worthless. Marker’s been doing some work for a solicitor called George Faulkner (Laurence Hardy) and he asks him to keep an eye on Dr Alan Skerrett. Faulkner is concerned about Skerrett’s wife Nancy (Susan Dowdall) as he considers himself something of a god-uncle to her. Skerrett’s recently cancelled a life insurance policy and also hasn’t renewed his golf club subscription. That indicates to Frank that he plans to leave, the question is does he intend to take anybody else with him? Marker quickly discovers that Skerrett’s having an affair, with Ann Lynn (Susan Lambert). But matters are complicated when Nancy pays him a visit as she also wants to hire him to follow her husband. She knows he’s having an affair – and who he’s having it with – she wants Marker to force him to choose between her and Ann. Works with Chess, Not with Life provides us with several good examples of just how good a liar Frank Marker is. One of his jobs for Faulkner concerns a woman called Miss O’Hara (Valerie Bell). She’s threatening to sue a local hotel because she claims they gave her food poisoning and she’s been hardly able to eat since. Frank strikes up a conversation with her in a pub and treats her to a slap-up meal – with Faulkner present to observe her healthy appetite. With Miss O’Hara, he slips effortlessly into the persona of a commercial traveller, complete with the gift of the gab, and she doesn’t suspect a thing. The main part of the episode revolves around Skerrett’s infidelities. To be honest, he’s so weak and indecisive that it’s difficult to understand what either woman sees in him. Eventually he decides that he can’t leave with Ann and she begins to make things difficult for him. So he becomes the third person to come to Marker to ask for help. It’s easy to tell that Frank’s not impressed with him. “How a so-called intelligent man gets himself … What’s it cost to train a doctor? About ten thousand? Ten thousand pounds worth of education. Do you know how old I was when I left school? Fourteen. And that was an achievement my mother boasted about”. Marker stops Ann from taking any action (by not strictly ethical means as he admits) and it’s another good example of how he’s able to spin a convincing yarn. Clearly he could have had another job as a confidence trickster! This isn’t a particularly Marker-centric episode since it concentrates more on the love triangle. And as Skerrett’s such an annoying character this doesn’t make it the most compelling of stories. But even average Public Eye is better than a great many other dramas.